True Hope and a Future: WHERE DO YOU FIND STRENGTH? Where do you find the strength to overcome difficulties in your life? Do you try to get it from worrying - thinking about every possible scenario and theoretically what your response would be? Do you try to get it from busyness - believing if you could only accomplish A, B, and C then you'll be ready to face the difficulties? Or, if you keep busy enough you won't have time to think about it, as in "If I ignore it, it will go away"? Do you try to get it from perfection - holding the mindset that if you just do everything right and make the most of every opportunity everything will be fine? It's obvious when reading it that these things don't bring strength, they sap it. Yet how often do we act in this manner, thinking we're actually doing something productive? How in the world am I going to keep up with them? I still have physical issues that keep me from accomplishing what I'd like to as it is. I can't be in two places at once, yet it seems like they both want the same thing at the same time! What about everything I won't be getting done because I'll be caring for two babies all day? 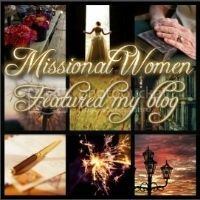 We have another Scripture Memory verse from Cindy Bultema over at "She Sparkles," and just in the nick of time! What a great reminder for me! Our strength doesn't come from anything we do, it comes from God. Rather than let my imagination run wild, I just need to keep my focus on God and trust in His promises. Father, I thank you for these two precious boys and the privilege of caring for them. Help me to quiet my mind and take captive all the thoughts floating around in my head. Strengthen my trust in you, for I know you would not call me to do something without equipping me to do it! We receive so much from God when we have His Word hidden in our heart! I hope you'll join me in committing His Word to memory. If you haven't started yet, there's no time like the present! If you haven't visited Cindy lately, head over here to her website where she's having a giveaway! 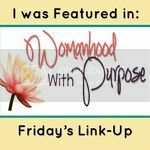 Linking up with "Women Living Well", "Word Filled Wednesday", "Works for Me Wednesday", "WIP Wednesday", "What Works Wednesday", "Reflections of His Grace", "Thought Provoking Thursday", "Life in Bloom", "Leaving a Legacy"
What a great reminder! Good luck watching your grandsons. They will be blessed tremendously by the time they spend with you! Thanks for linking up to What Works Wednesday! I've read a lot of posts in recent days about keeping our focus on God and getting our strength from Him...I think He's trying to tell me something! What a joy-filled blessing to get to care for two sweet grand babies! I'm praying for God's strength and energy for you"
I have battled each of those patterns you described! It's hard to resist those thoughts and simply trust in God. What a blessing you are to your daughter and son in law! Thanks for linking to WIP Wednesday! Oh my, you will be one busy lady but I so agree that grandkiddos are such a blessing from God. And you are so right, when we focus on other things instead of the Lord it does sap our energy. One of my biggest struggles is relying on God instead of trying to do it myself. I sometimes need to repeat this verse hourly. HE has control and HE knows what HE is doing. Now to just trust HIM. Hi Lisa! Thanks so much for visiting my blog. It's great to connect with you! And I love the scripture memory plan you've implemented -- CLEVER! I've never thought about doing that, but I think it'd be fun to do with my college kids!! I love the verse you shared, it was just what I needed to hear today and definitely one that I need to memorize. Found you through leaving a legacy. God bless you. Blessings to you and thank for linking up. Wonderful post, what a great way to memorize scripture. I'll be praying for strength for you as you watch your grandchildren. Thank you for sharing and for linking up at Leaving A Legacy!